In the open lot at the corner of Wisconsin Avenue and Brandywine Street, you can find all the details about Art All Night at our Welcome Center tent. Be sure to pick up the FREE Tenleytown Guidebook featuring a schedule and map of Art All Night events, as well as special promotions and discounts at area shops and restaurants. For our over-21 guests, purchase Art of the Drink wristbands here to gain access to cocktail, wine, and beer tastings at Art All Night venues. And learn how you can enter a free raffle to win prizes from local businesses. Theodore Carter presents the Tenleytown Bestiary and Selfie Garden. Friendly enough for the smallest visitors, yet big enough to astound, the creatures in our bestiary love to show off their teeth, claws, and impressive size! Come and grab that perfect selfie with a menacing beast looming overhead. The first 100 visitors will also get a piece of art to take home. 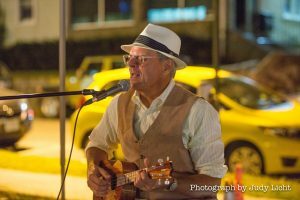 From 8:00-11:00 pm, Jim Greenfield is our musical host at the Welcome Center, bringing back his popular 100 Years of Popular Music. Listen as he performs at least one song from every decade from 1900 to today.